The Odor-Off® Bottoms-up Extractor uses sub-surface extraction to thoroughly remove odor contaminants that have soaked deep into carpet padding and upholstery. First, completely saturate the odor area with the diluted Cat Odor-Off® solution and wait long enough for it to penetrate. Usually 3-5 minutes. 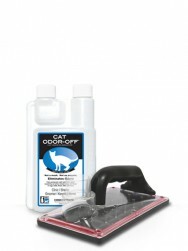 Second, connect the Odor-Off® Bottoms-up Extractor to your shop vacuum and place it on the saturated area. Extract until damp. Third, let the area completely air dry and then evaluate. Some carpets can take up to 3 days to dry. If any odor remains the source was not contacted. Repeat the process.